We've added an interactive tour to Speedy Route, to help guide you through the various options and features that are available to you. 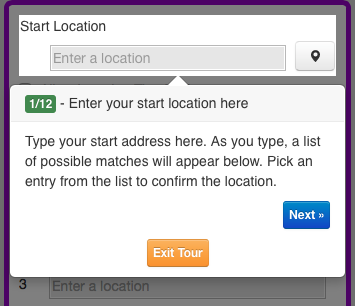 You can simply click 'Next' on each tip to go to the next tip, or instead interactively follow the instructions. In the example above, if you enter a Start Location, the demo will automatically move on to the next step. Take a look at all the tips to see what Speedy Route has to offer!